Hello there! I’m not sure where this week went. Time sure flies, doesn’t it? One of my goals for the new year was to come up with some regular weekly posts on my blog. So welcome to the first edition of Clean and Simple Thursday! As many of you know CAS cards are not my usual “thing." Don’t get me wrong, it’s not that I don’t love the style, I just struggle with knowing when to stop adding layers and embellishments to a card. I’m also challenging myself to make cards that are easy to pop in the mail, so hopefully trying to focus on CAS cards regularly will help. I actually created 16 of these cards for our monthly team swap at our meeting earlier this week. One craft supply I tend to collect but rarely use is washi tape. I think I might have mentioned how obsessed I am with the new Tutti-Frutti Suite of products in the new Stampin’ Up Occasions Catalog. 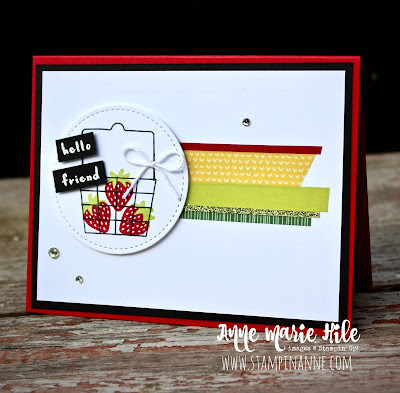 I decided to focus on focusing on showing the new Tutti-Frutti Washi Tape a little love on this one.. I like how it adds a fun pop of colors and pattern without adding a lot of bulk. After I got all of the washi tape down, I decided to add a tiny “slice” of the Myths and Magic Glimmer paper, because…well, it’s just SO pretty! 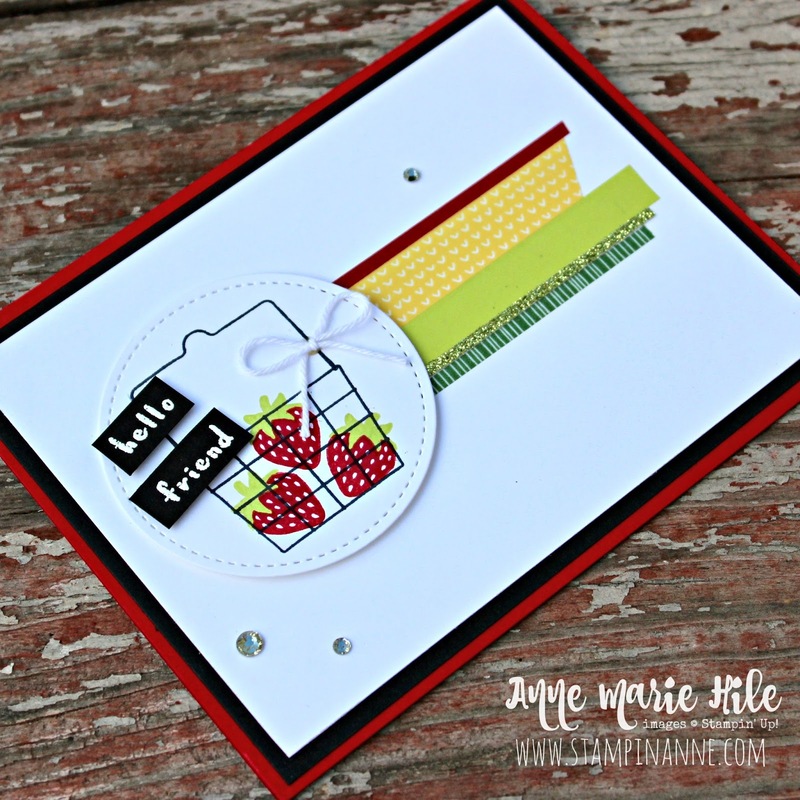 The Fruit Basket stamp set is photopolymer, so it is really easy to line up the images. That’s always a great thing! The sentiment is heat embossed for a little extra something-something. Finally I added a little baker’s twine bow and a couple of rhinestones. I really like the end result and I hope you do as well.